Fitbit Inc. (NYSE: FIT) stock is up 38.7% during its six-month run as a public company. And our Fitbit stock price prediction shows the firm will maintain that momentum in 2016. Investors have loved the fitness-related wearable tech company ever since its highly anticipated debut this past summer. On June 18, the Fitbit IPO raised $732 million by selling 36.6 million shares for $20 each. According to Renaissance Capital, a manager of IPO-focused ETFs, it ranks as the sixth-largest IPO of 2015 and the second-largest tech deal, behind First Data Corp. (NYSE: FDC). 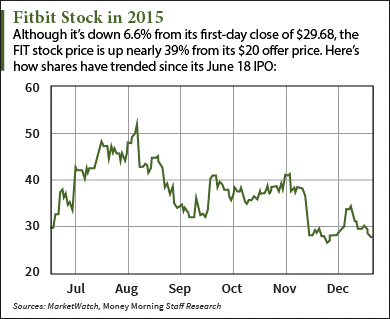 The Fitbit stock price soared 47.2% during its first month on the market. It peaked on Aug. 5 at $51.64 a share – up 158% from the company's offer price. But after hitting that high price, the Fitbit stock price has been highly volatile. Broader market volatility due to concerns over the Chinese economy brought the Fitbit stock price down 33.2% from its high price by the end of August. The stock rebounded in September and October, and gained 17.5% in those two months. But shares cratered 29.2% in November despite a stellar Q3 earnings report. FIT stock is now down 3.4% in December. According to Dealogic, Fitbit is one of only three of the top 10 largest IPOs this year trading above its offer price. In fact, Fitbit stock has seen a total return of 38.7% from its IPO price. That beats TransUnion's (NYSE: TRU) 20.1% return and makes Fitbit the best-performing 2015 IPO that raised at least $700 million.